Like the harp, oboe and tuba, bassoon in jazz is not a common instrument but all have been occasionally successfully employed as lead soloing instruments. Amongst a handful of others, Illinois Jacquet and Lindsay Cooper both played bassoon in a jazz context. Cooper, who died of MS in 2013, was depicted playing the bassoon in John Fordham's excellent 1993 Dorling Kindersley primer Jazz . On the instrument, Fordham states: "The bassoon's sound was described by writer Sacheverell Sitwell as 'like a sea-god speaking.'" Perhaps anticipating the listener's bemusement, Michael Rabinowitz, by way of explanation, acknowledges the rarity of the instrument in this context saying: "This CD continues my mission to showcase the bassoon in a jazz setting featuring the instrument's expressive and improvisation abilities. Although I have experimented with pickups and effects I had special interest in preserving and exploiting the acoustic sound of the bassoon on this recording." and judging by the quality of the album, this was a good call. 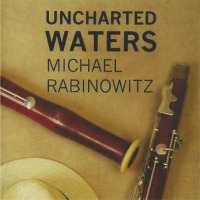 The album opens with Rabinowitz's own composition, "Uncharted Waters," which is quirky yet effective and written to express his feelings concerning the loss of his parents who both died within a short time of each other. "Harold's Blues," also by Rabinowitz and dedicated to his late father, is more straightforward with excellent support from guitarist Nat Harris. The standard "Caravan" is given a lively arrangement and the gentle ballad "Kiki's Theme" is dedicated to Rabinowitz's late mother. Antonio Carlos Jobim's timeless classic "How Insensitive" is given an especially delicate treatment. After over a minute of solo introduction, Art Farmer's "The Third" picks up a swinging pace and the ballad "When Sonny Gets Blue" sounds like it could have been written for the bassoon. The final number is the Afro-Carribean inspired "Calypso Joe," again penned by Rabinowitz. In the pursuit of his lifetime mission, Rabinowitz has succeeded in producing an album of chiaroscuro charm and elegance. Anyone still unsure as to this recording's delights should, to borrow a phrase from George Michael, "listen without prejudice" for they will surely be rewarded. Track Listing: Uncharted Waters; Harold’s Blues; Caravan; Kiki’s Theme; So Do It; How Insensitive; The Third; When Sonny Gets Blue; Calypso Joe. Personnel: Michael Rabinowitz: bassoon; Ruslan Khain: bass; Nat Harris: guitar; Vince Ector: drums.